What’s Before You, Blessings or Curses? When you look into your future, what do you see? Blessings or curses? I remember a song we sang decades ago, “I Have Decided to Follow Jesus.” The lyrics of one of its verses were, “The Cross before me, the world behind me…no turning back.” It is a powerful song of consecration. It reminds us of our decision to stop living for self and to start living for Christ. It enjoins us to keep our eyes on the Cross. But we should not lose sight of the fact that the Cross upon which Jesus died is actually behind us. That’s right! The Lamb of God was slain before the foundation of the world and it was nearly two-thousand years ago that Jesus was crucified for us. Now, this is hugely important. Why? Because it was on the Cross that Jesus broke the power of sin and delivered us from sin’s penalty. It was on the Cross that He brought an end to the Law of sin and death, and where the reign of Grace began. It was at the cross that the curse ceased and undeserved blessings and favor began. At the cross heavenly demands gave way to divine supply. Think about this for a moment. If the Cross is where God overcomes everything for you and the Cross is behind you, then sin and judgment, sickness and poverty, fear and failure are permanently behind you. They were all overcome for you at the Cross. Now, because Jesus overcame every curse for you at the Cross, and solved every problem there, you won’t need to overcome them in your strength. You simply need to receive your victory by faith. 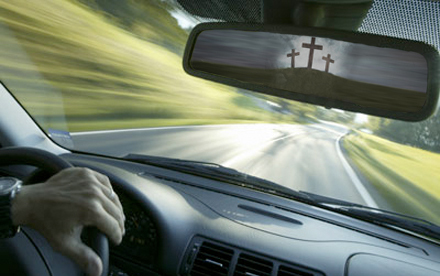 And the way you do this is to look back at the Cross and see Jesus conquering every problem there for you. And then, while fixing your eyes on the Cross, instead of confessing fear, keep boldly declaring your faith in Jesus’ finished work. message on the cross of Christ. Thanks Bishop. The cross is the end point of curses and the start point of blessings. BISHOP,Thank you, for this timely remainder and an encouragment. I believe the Church and the Body of Christ,need to hear more, often the Grace messages. Grace massages are very lifting.Please continue with more of Grace messages.